Trainer Jessica Harrington broke her Royal Ascot maiden tag in style today, her Mastercraftsman filly Alpha Centauri, owned and bred by the Niarchos family, winning the G1 Coronation Stakes by six lengths and in a course record time of 1m 35.89s from the Mark Johnston-trained Threading. Winner of the Irish 1,000 Guineas, she was one of three Guineas winners coming into the race, and on paper it looked a hugely competitive renewal of the race over Ascot's round mile. 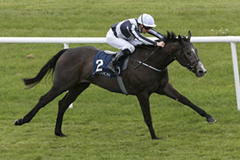 Alpha Centauri loomed upsides the leaders coming into the home straight and jockey Colm O'Donoghue kicked early, the pair put the race to bed in a matter of strides. A beaming Alan Cooper, racing manager to the Niarchos family, said: "We always been happy with the filly and Jessie lets the horses do the talking, and there was nothing negative ahead of the race. She does the training and said everything was good and so you just have to take the chance. Going into the race we were very nervous, looking at the form of the others, but we've shown them all today. "I don't need to tell you anything about Jessie - her record and her achievements tell you everything. I saw the filly on Saturday and she looked wonderful. She travelled well and what happened today was amazing. It's the Niarchos family's third Coronation win and it is fabulous for our broodmares." Harrington, also a successful Cheltenham Gold Cup-winning trainer, said: "First, I am relieved; I definitely was very nervous today as I know she is a great filly. It was rather nice going into the Irish 1,000 Guineas as we were very much under the radar, she hadn't run well on soft ground two runs before that - today we were there to be shot at. "I suppose we were very disappointed when we were beaten here with Alpha Centauri last year when she was second in the Albany Stakes - but that's racing, some things happen and some things don't happen - it's great when it does all come together. Of the filly's preferences, Harrington explained: "The ground is the key to her. As you see there, she is a very big filly - she weighs 520kg - and I think when she is on soft ground she physically can't get her feet out of the ground. She just floats on top of the ground. What she wants is good ground, what she doesn't want is heavy ground. "Colm was very confident on her, she jumped well and settled great and when Colm turned in I thought 'jeepers, he has gone very soon,' but the further she went the quicker she went." Of training her first Royal Ascot winner, Harrington said: "I have a lot of good people behind me and a lot of very nice owners who give me nice horses. It's very special [to have a Royal Ascot winner]. I have had Ascot winners but never Royal Ascot winners - it is absolutely fantastic. I had sort of been getting to the stage - with Torcedor going very near yesterday - of thinking 'will it ever happen?' She was my last runner this week, so I said to myself that it was now or never. "I was getting more and more nervous because it was a very good race. She has a fantastic temperament and is very easy to train. Probably the key for her is that she is so relaxed - Colm said that was only doing a half-speed going up the hill. She is a big-striding filly and Colm didn't want to break her stride at all. "She only ever works on the bridle at home, but she did that sort of run in the Irish Guineas, when she had to go and catch the horse in front of her and then stayed on." As for future race plans, Cooper said: "I have to talk to Jessie and Maria and Electra, but there is a race at Deauville in the middle of August that the family sponsors, it might be an option." Harrington added: "I really have to sit down and talk to Alan and Colm, and try and make the right decisions for her. We can dream, plan and see where the owners would like to take her." When comparing the feeling of a top level success jumping compared with on the Flat, Harrington said: "Any winner is a great winner, and to have a Grade 1 winner over jumps or a Group 1 winner on the Flat, it is the same feeling, it is fantastic. "Flat racing is over quicker, which is great, jumping you've got to go three miles and two furlongs and over fences and it's an awful lot of time and you've got to have an awful lot of heart jumping out of the mud. "My yard is now about fifty-fifty jumping horses to Flat horses. I have a great team and lots of family work for me - both daughters work for me and I am about to get my son in law too. I hope we'll get on well together!" 9 ran, Time- 1m 38.51s Dist-1½, 3. First run in 1840, the Coronation Stakes was founded to commemorate the crowning of Queen Victoria in 1838. The mile event for three-year-olds became the fillies’ equivalent of the St James’s Palace Stakes and established itself as a natural progression for fillies who had run creditably in the 1,000 Guineas at Newmarket. The inaugural running went to the Lord Albemarle-owned Spangle, while the first filly to complete the 1,000 Guineas/Coronation Stakes double was the Jos Dawson-trained Lady Augusta in 1863. The race now attracts the principal protagonists from the English, Irish and French 1,000 Guineas, although it has not always been a particularly happy hunting ground for the winners of the British fillies’ Classic - Sky Lantern in 2013, Ghanaati in 2009, Attraction in 2004 and Russian Rhythm in 2003 won both contests, but before that One In A Million in 1979 was the previous filly to follow up Newmarket Guineas success with a Coronation Stakes win. The contest, run over the round mile (7r 213y) at Ascot, is part of the QIPCO British Champions Series and was promoted to G1 status from G2 in 1988.